For winery dining within easy reach of Melbourne, it’s hard to go past lunch at Yering Station in the Yarra Valley. 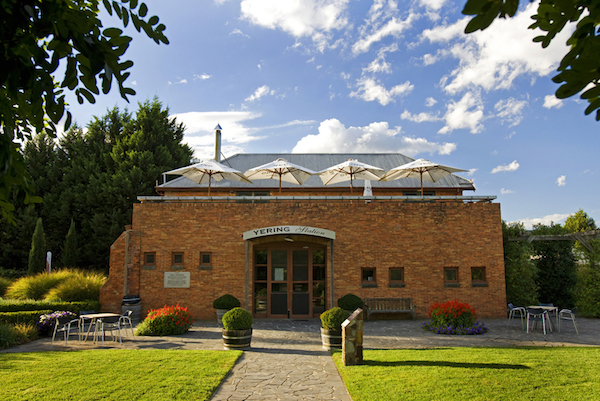 Victoria’s oldest winery is home to an historic cellar door and contemporary restaurant, which is still scoring architectural plaudits almost 20 years after it was built. On a recent visit, hosted by Yering Station, I joined winemaker Willy Lunn for a wine tasting, followed by lunch with Brad Rathbone in the restaurant. The tasting kicked off with a glass of the 2010 Yarrabank Cuvée (sold out, I’m afraid), this elegant sparkling boasts crunchy acidity, green apple pep, and a creamy mouthfeel thanks to four years on lees. “I pick on flavour, rather than acid,” said Willy. “We’re not out to make Champagne, we’re just trying to make great Australian sparkling wine.” Mission accomplished, I’d say. Next up, Willy poured a pair of chardonnays. With its flinty, mineral aromas, and crisp palate of grapefruit pith acidity and a gentle lick of smoke, the 2012 Yering Station Chardonnay ($40) is my kind of wine. Still quite taught and reserved on the nose, the 2013 Yering Station Reserve Chardonnay ($120) is one for the ages, with length, finesse and drive that will ensure its longevity, and body courtesy of mid-palate sweetness. The pinot noirs were similarly en pointe, starting with the perfumed 2012 Yering Station Pinot Noir ($40), with its nose of black cherries and violets, followed by the 2013 Reserve Pinot Noir ($12). Made with 100 per cent whole berry, the Reserve has savoury, briary notes, an elegant palate with supple tannins. Another standout from the Yering cellar was the shiraz viognier. “In the Valley, shiraz can be a bit skeletal, a bit boney,” said Willy. “Viognier adds that body and plushness.” The co-ferment of the two grapes, plus astute site selection, results in wines that balance pepper and cooking spice nuances with black fruits and floral perfume. For his next dish, Tom sourced Wilhelmina trout from the nearby town of Murrundindi. 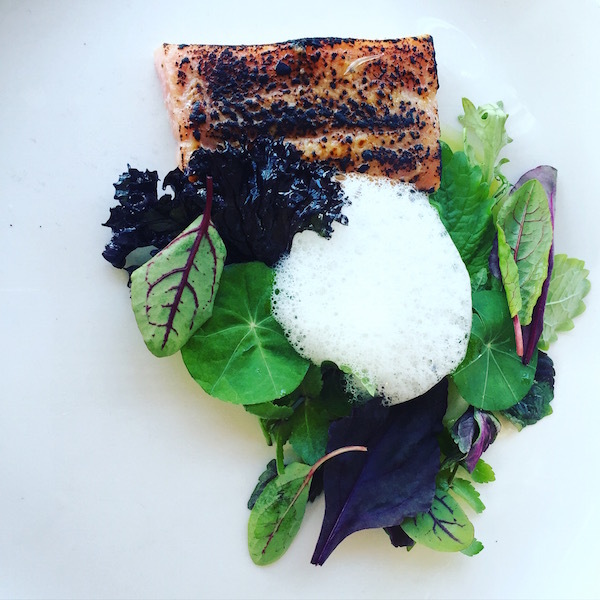 He brushed the trout with miso then torched it to a burnished, nutty glaze, before finishing the dish with a delicate horseradish foam, crisp kale leaves and freshly plucked herbs from the kitchen garden. To match, the bone-dry 2015 Village Nebbiolo Rosé. 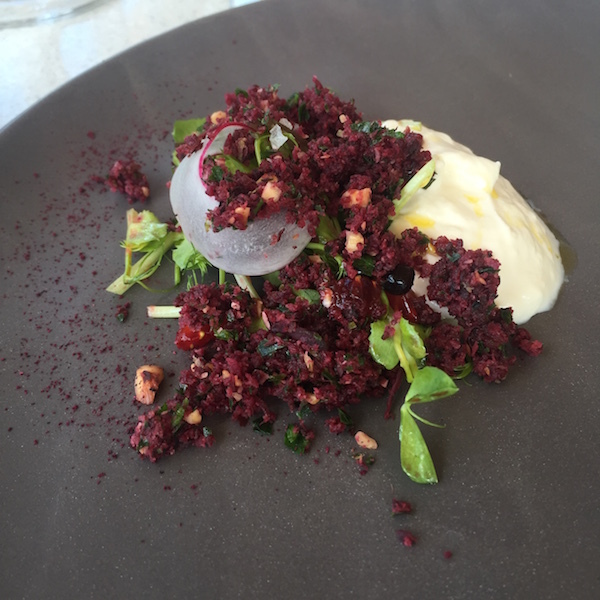 For more on the Yarra Valley, take a look at my one-day Yarra Valley Gourmet Tour.